The new digital marketing tool means there's "no excuse anymore" for sacrificing user experience. Microsoft claims a new project to personalise customer experiences through the Xbox device is about making the switch from digital marketing to marketing in the digital age. Microsoft's Project EBC utilises the Xbox One, along with the smart glass application and Sitecore’s Customer Experience Platform (CEP), and is a companion tool that monitors when the consumer engages in activity connected to their Xbox, such as gaming or watching media. While engaging, the app feeds relevant content in real time onto a user’s mobile device. The project was undertaken in partnership with Object Consulting. “There are a lot of moving parts to it, but effectively it’s a narrative around the consumer on their Xbox at home,” said Object’s supervising consultant, Mark Macumber, at the recent Sitecore Digital Trendspot conference in Sydney. Macumber cited an example where a user is watching an episode of MasterChef. In a segment where Matt Preston is cooking muffins, data being fed into the app includes episode ratings, similar genres, muffin recipes, links to the equipment being used and where to buy them, as well as links to relevant competitions or events. “All that data is coming from the Sitecore platform and being fed into the Xbox, so it’s publishing new segments all the time, getting content up to date, getting feedback and putting rich information into the hands of consumers,” he explained. Tokens peppered along the timeline of the video serve as key bookmarks for content so users can visualise where and when data becomes available. Behind the scenes, that content is created and customised by marketing teams within retailers and media organisations based on collected personal data from the user’s behaviour. “The dynamic CEP is learning and listening and updating its infographic information as the user engages with the app,” said Macumber. Information can also be saved and accessed from any device in any location. “You can be on your phone or tablet while watching TV, save it and then go to [the supermarket]… then have a look at your favourites to remember the brand of knives you wanted to buy, or ingredients for the recipe you wanted to make,” he said. Macumber said key to the project’s success is that content is presented as a fun and useful tool for the consumer. “There’s no excuse anymore to not be producing a wonderful user experience,” he claimed. 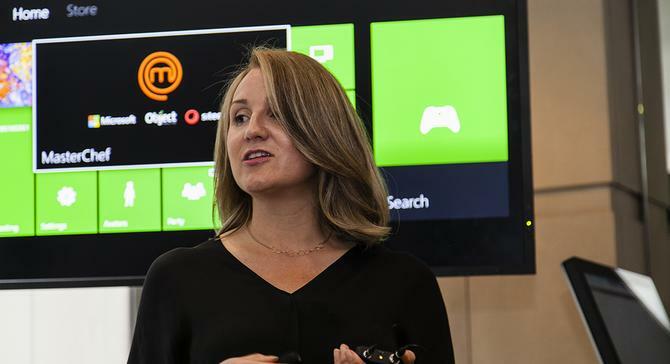 Marcy Larsen, Microsoft’s retail industry market development manager (pictured), said one of the major drivers for Project EBC was to provide technology to users that enhanced, rather than took over, their lives. According to Larsen, consumers want technology to know what they want, when it’s most convenient, while not having to feel like the collection of their personal data is an invasion of privacy.